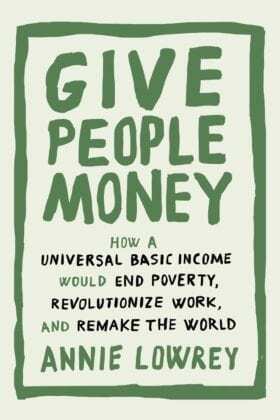 Annie Lowrey is the author of “Give People Money,” the latest book to offer the case for Universal Basic Income in the United States. She recently spoke to the UBI Podcast about her new book. Lowrey first wrote about basic income in the New York Times for a 2013 article about the Swiss UBI referendum. This was right before the surge of international interest in basic income that persists today. “Give People Money” gives a straightforward account of basic income for a broad audience, emphasizing the increasingly precarious situation for workers around the world. Lowrey gives a voice to actual recipients of basic income pilots who are quoted in the book as being empowered by the unconditional cash transfers. In the podcast, Lowrey said what draws her to basic income is how the “universality” of the program unlocks discussion about an array of societal issues. “It lets you talk about feminism, it lets you talk about the problems with GDP and how we measure welfare, about government paternalism,” she said. There have been criticisms of Lowrey’s book and others that discuss UBI for the lack of specifics regarding financing. She said such a demand at this time is a “high-barrier to clear” for financing a full basic income. “Almost all of our big social programs have started small and gotten bigger,” she said. Regarding political feasibility, Lowrey said she would be willing to accept “marginal improvements” that may be more feasible in the short-term, such as an expanded Earned Income Tax Credit (which is only provided to those who are working and is targeted for lower income households). Tyler Prochazka has written 82 articles.